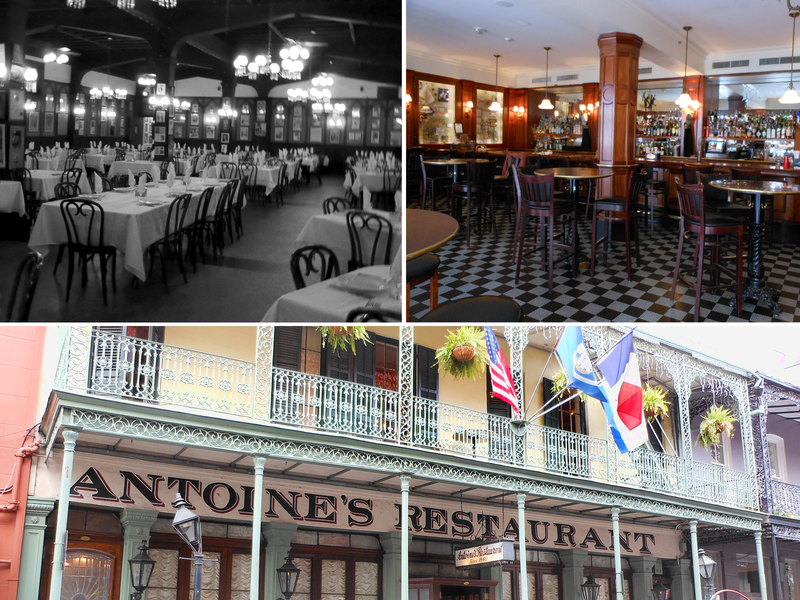 New Orleans is one of my favorite cities, especially since my husband is from Lake Charles and has me hooked on the food! So naturally I jumped at the chance to join him in NOLA even though he would be attending a convention and I would be on my own… Some may think “no way,” but the chance to eat, drink, and do exactly what I want in a city that doesn’t sleep was exactly what intrigued me. It turned out to be one of my favorite stays! Of course it all starts with where you stay. There are so many fine choices; however I must say that The Roosevelt New Orleans exceeded my expectations. Originally built in 1893, the interior of the hotel made me feel like I was stepping back in time as I walked down the corridor with its massive columns, antique chandeliers, and mosaic tile floors. 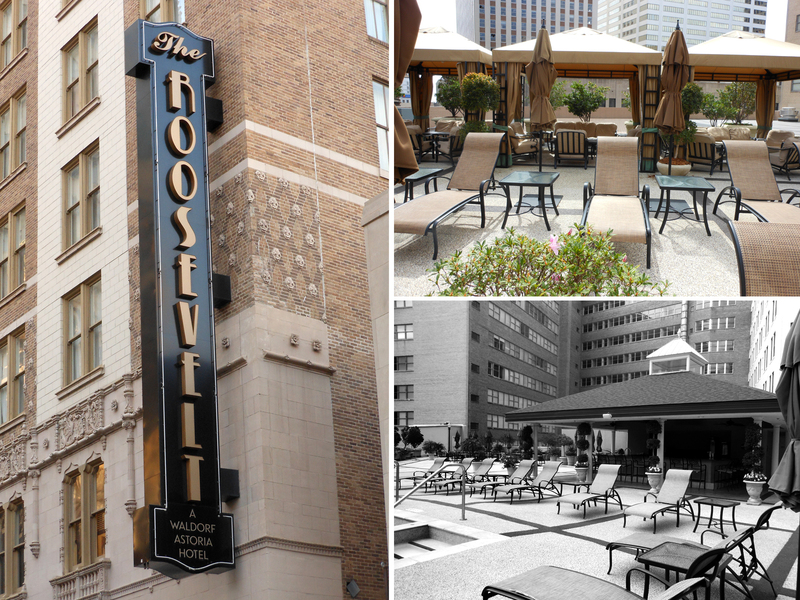 As with most of New Orleans, The Roosevelt closed after Hurricane Katrina and after completing a full renovation reopened in 2009. The Roosevelt has since become a member of the Waldorf Astoria Hotels offering the finest luxury accommodations; blending history, glamour and today’s amenities. Unfortunately it was little too cool to take advantage of the rooftop pool, but I did enjoy the fabulous views of the city from up there. Not to worry, there were plenty of other ways for me to relax and I did in the Guerlain Spa with a specialized deep tissue massage just for me. Fully relaxed and ready for the day, I didn’t even make it out of the Roosevelt before The Sazerac Bar beckoned me in for a drink. 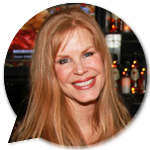 (It’s ok…you can drink before noon in NOLA!) One wall showcases large murals depicting life in New Orleans during the early 1930s while the bartender is more than willing to tell stories of all of the famous and not so famous patrons that have caused a stir – my lips are sealed! Hopping on the streetcar, a great way to see the city, it didn’t take long before I was in the Garden District. 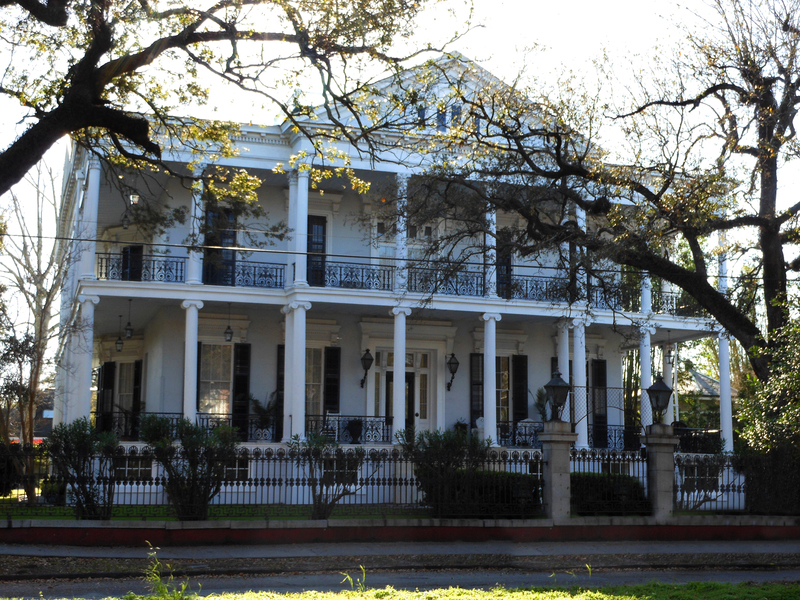 The old Southern-style homes—or should I say mansions—were immaculate. No signs of Hurricane Katrina here. I was prepared for a day of shopping on Magazine Street but realized it is actually miles of antique stores, clothing shops, galleries, and restaurants. There is no way to see it all in a day, but I tried! One of my favorite shops was the Courtyard Gallery in the French Quarter. They specialize in using salvaged items such as doors, shutters, and tabletops from Hurricane Katrina and carving them with New Orleans-themed paintings. I love the green aspect of their recycling; truly one of a kind interpretations of a historical city. And history is the key word when speaking of NOLA. Take time to visit the Cabildo and Presbytere, two historic buildings which are part of the Louisiana State Museum. The Cabildo showcases Louisiana’s early years, while the Presbytere’s exhibit, Living with Hurricanes/Katrina & Beyond, focuses on the devastation and impact it had on lives in the area. 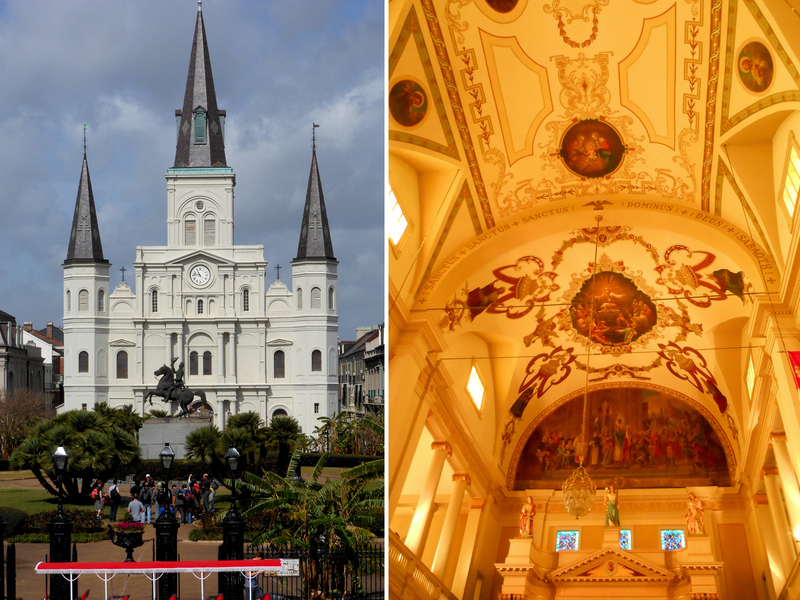 Nestled between the Cabildo and Presbytere is the Cathedral-Basilica of Saint Louis King of France. It is the oldest Catholic cathedral in the U.S. and the perfect place to sit and reflect. Surrounded by murals on the ceiling, intricate statues, and powerful organ music, it’s an emotional experience. 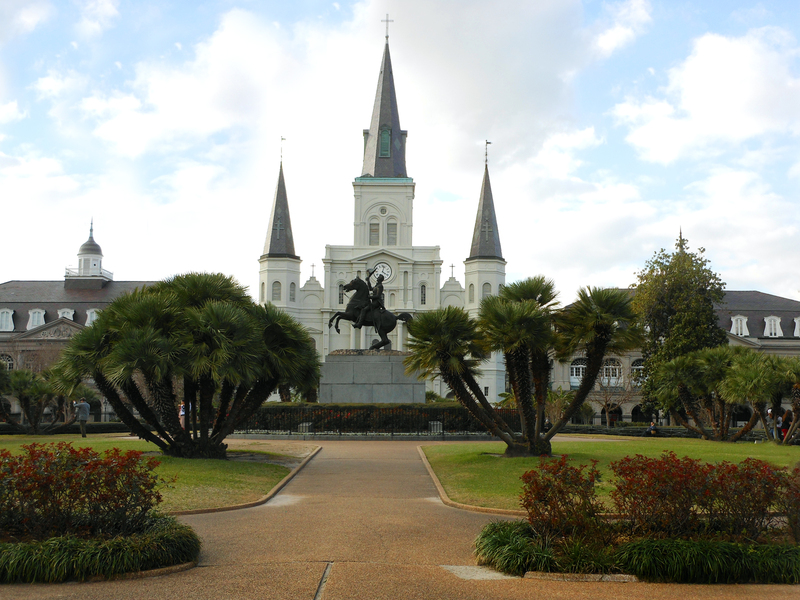 Another famous landmark, just in front of the Cathedral, is Jackson Square. Named for Andrew Jackson, a hero in the Battle of New Orleans and President of the United States, the park prominently displays a large statue of him on his horse. The Square is well known as a gathering place for artists, musicians, carriage rides, street performers, and magicians. You never know what to expect! Café Du Monde Need I say more? 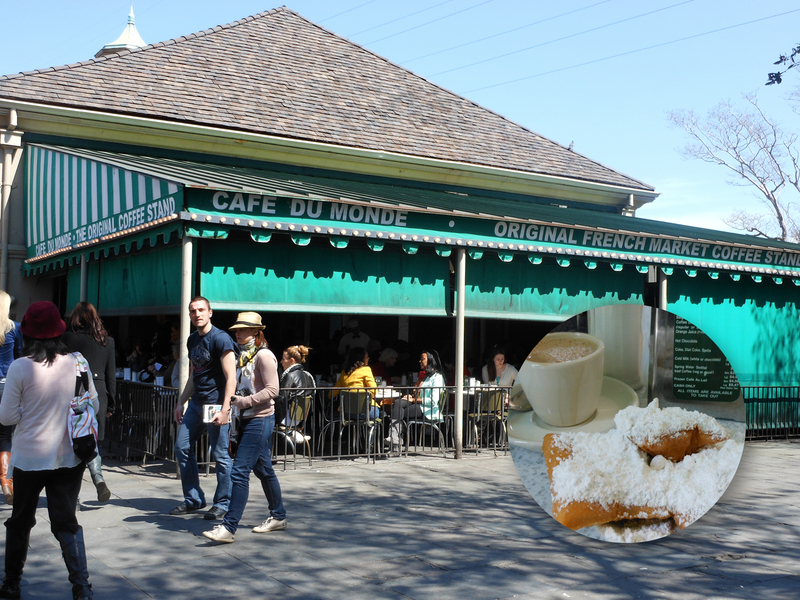 Famous for its beignets and dark-roasted coffee and chicory, this café is open 24/7 except for Christmas Day, and of course in the event of a hurricane. The original shop is in the French Market, but they have opened several others in the New Orleans area so you’re never too far from some of the delicious French-style doughnuts covered with powdered sugar. 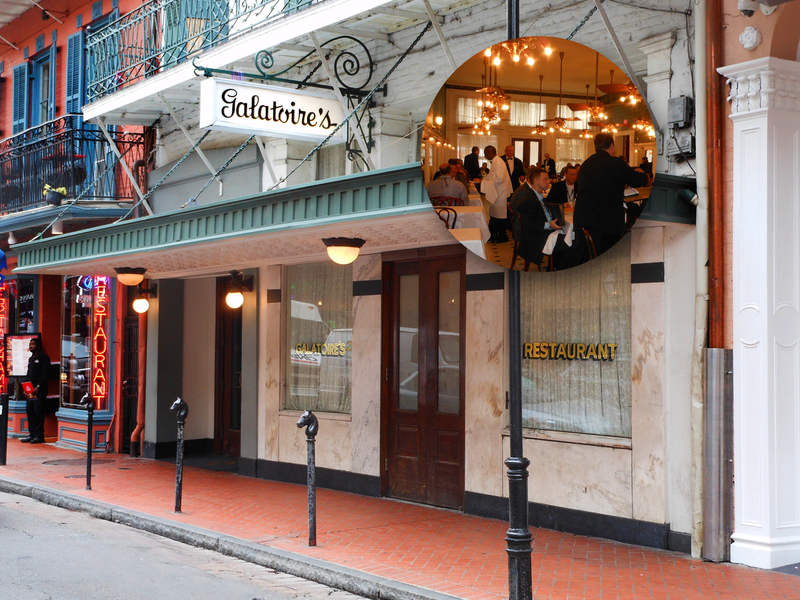 Galatoire’s A part of New Orleans for over 100 years, this icon has an abundance of seafood that is expertly prepared. The duck gumbo and stuffed avocado crab meat salad were perfect, but be prepared to stand in line: they don’t take reservations. Arnaud’s Jazz Bistro No trip to New Orleans is complete without a little jazz and there is no place better than Arnaud’s. 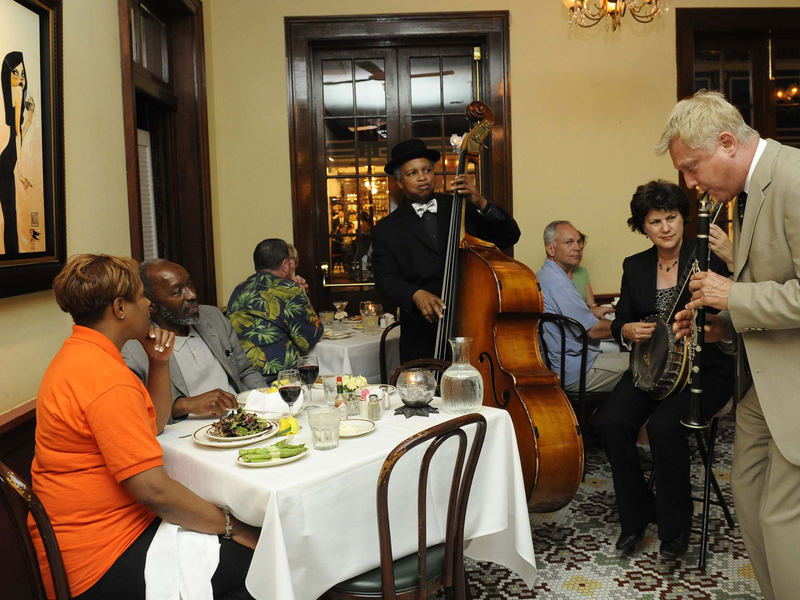 I thoroughly enjoyed the relaxed atmosphere, live Dixieland jazz band and views of Bourbon Street, all while enjoying spicy Shrimp Creole, fresh baked bread and Louisiana-brewed Abita beer. If you’re looking to hit a Florida beach with the family this summer, my recommendation is Laketown Wharf in Panama City. They offer that area’s best bang for your buck. With direct flights from Nashville on Southwest, your family can be body surfing, building sand castles or just relaxing on one of the most beautiful white sand beaches within just a few hours. 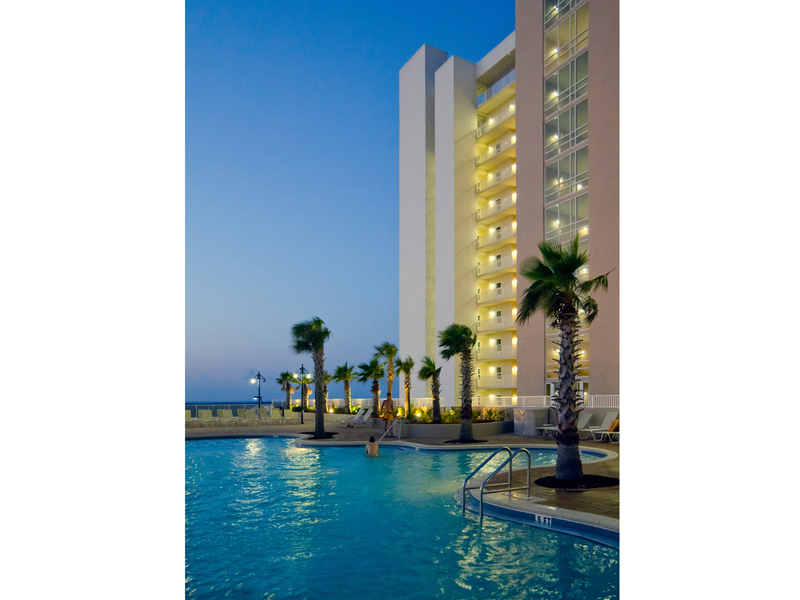 This contemporary, soaring white Sterling Resort property sits at the center of the active Panama City strip, so it’s close to restaurants, shopping, and family attractions and is just a short distance from Pier Park and Frank Brown Park. 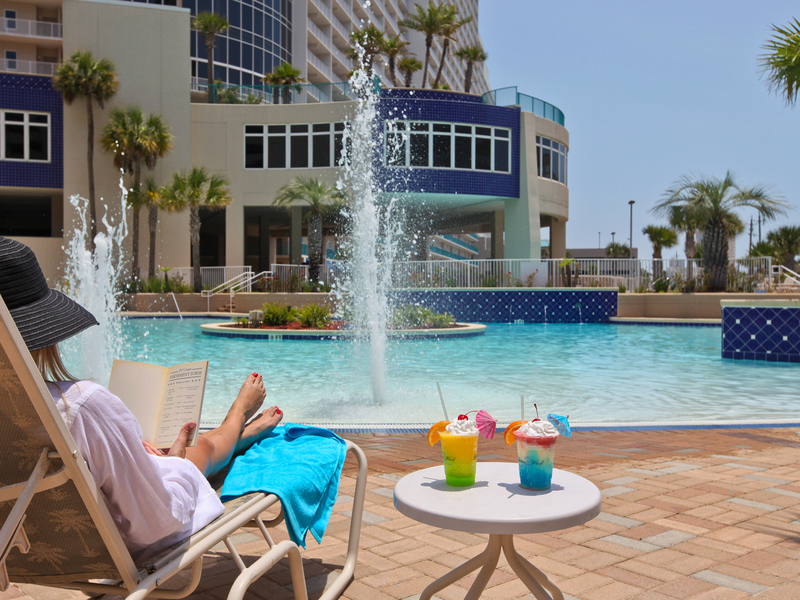 Laketown Wharf has five different pools, including a rooftop pool on the 10th floor and a kid’s pool, a fitness center, and a huge boardwalk that wraps around the lake on the property. 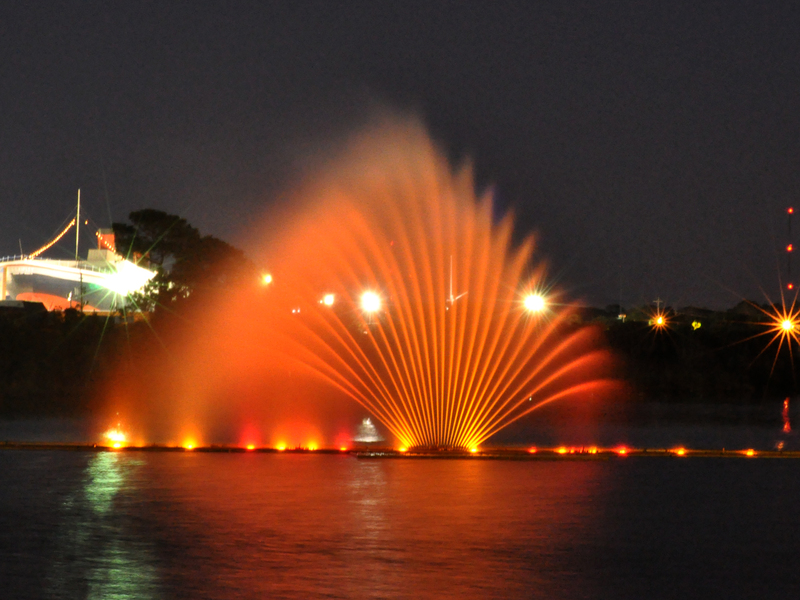 There’s a cool light show to music each night in the center of the lake. We also loved the newly expanded porte-cochère at the front of the resort for loading and unloading luggage when those pop up storms blow in. All of the 1-, 2-, and 3-bedroom condominiums have larger floor plans so there’s that feeling of being in a home rather than a hotel. The condos are beautifully furnished and decorated, featuring 32-inch flat screen TV’s in the bedrooms, and high-speed internet. Every balcony faces the water offering spectacular Gulf, Lake and Golf Course views. After our active days on the beach, it was lovely to watch the sunset from the 22nd floor balcony while enjoying a cold beverage. This is my favorite Panama City stay when my family needs a few days on the beach. With renovations in progress, additions to this great resort will include a coffee café, an on-site restaurant, and a renovated pool cafe. 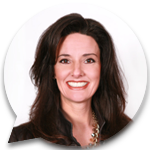 Make your reservation now for a quick get away, or you can rent long term and stay awhile.